Roopkund trek review, over the hills and far away. The moments that define us, the unadulterated time frames where in we just sink in beauty without a passing thought at the futility of capturing it; remain enshrined in the memories forever. In an empirical way it grows on us, like a lump in the throat. A clever riposte to reclaim among other highs, life itself. One, indeed, travels in order to come home. Drowning all along and subtly realizing it. I have lived my life in parenthesis. By the green door on a still greener hill, I would read Tom Sawyer and pretend to be him. Anything that I could become to escape from myself. The mystery of Roopkund lake isn’t shrouded in thin air and misty mountains but in the hearts of those who listen with bated breath, the legends of the fall. A living adventure in all that’s adrenaline, Roopkund trek is for those who find solace in escaping the grim reality of urban life. A retreat at every bend. And sometimes if you look closely along the trail marks, you may discover your self, somewhere in the meadows or over the hills and far away. 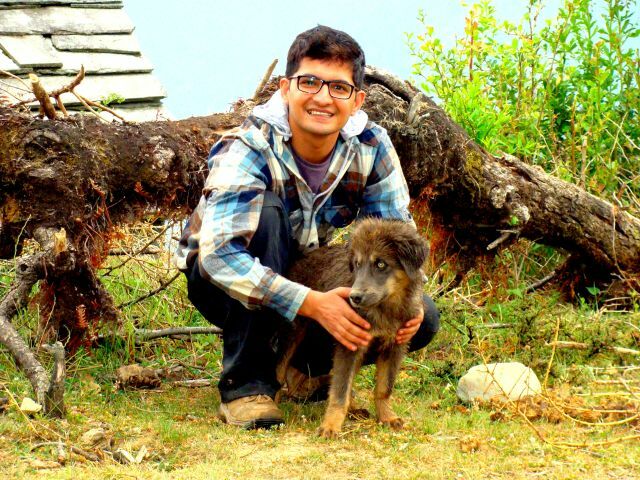 Jaggu Jr, the ‘wolf’ pup ran with that carefree mirth that only dogs know about. Those deep piercing blue eyes, wagging tail and paws mapped the mountains with unrestrained spirit, an ethereal sight! As I attempt to pen down Roopkund trek review, I can’t help but realize how simple life seemed in a region we would otherwise label as the harsh. And when marred by urban humility, the stasis clogs, you realize what you lost and what was lost in you. Forgetting all the troubles of the world outside the periphery of the mountains – letting go of dates and days, forgiving bosses and escaping the burden of thoughts only the realize the weight of water in the backpack. The canopy of night sky at Roopkund base camp, the chimes of bells on cattle and canine alike…the carelessness with which we would throw ourselves to the green beds of Bugyals. With a bated breath we marvel at all that is unscathed by men and his motives ─ the mountains and the mist. They are the only stamps of eternity that our hearts will carry. Leaving an indelible impression, a memento like that helps remember that we were all wild once. Ridiculing both, rhyme and reason I realized what came to me and what I had come to. The highlight reel for me wasn’t the lake shrouded in mystery but the journey in it’s wake. 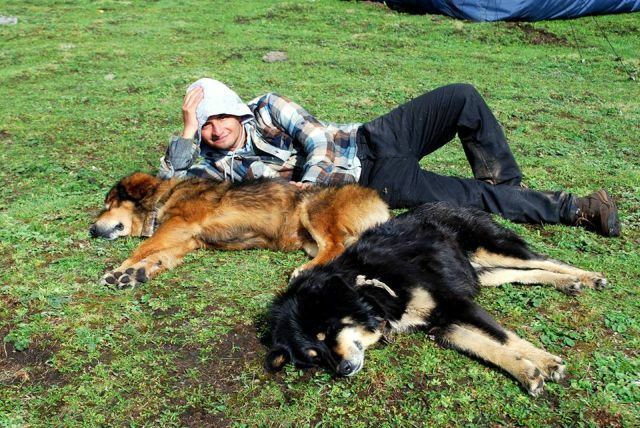 From sleeping beside mountain dogs on meadows to playing pranks on unsuspecting trekkers, perhaps that moment is still waiting for me somewhere holding on to that corduroy jacket, longing for a sense of belonging somewhere while I wait here in the humdrum of the city. One of these days I will earmark the ode to tranquility again but for now, let’s brace ourselves to the mad world again. Our solemn prayers for the home turf Uttarakhand which is braving the havoc caused by heavy rains. Makes me want to go for it…I hope the kind people and animals that you have mentioned in the post are safe at the aftermath of calamity in Uttarakhand. Thanks Khushboo, here’s hoping that tranquility returns to the pristine hill state soon. My deepest condolences to the tragedy struck people of hill state. Thanks for the kind words:) I hope you live the experience soon. Wow, that sounds just lovely! And I love it that you could be with the unfettered animals! I remember all my hikes and beautiful moments by “that chipmunk that hopped up to us” or “that duckling we fed” and your story sounds like heaven to me! Just checked out the super cute FB page! I don’t have good dog pics since my triple whammy with phone, harddisk and laptop crashing, but I do have some snaps and videos of urban wild animals- a mama raccoon begging and my backyard squirrels’ antics. let me know if that works! Pingback: Munnar: Of sights, spices and splendor! | Diet delights! Pingback: 10 awesome ways to exercise with your dog!